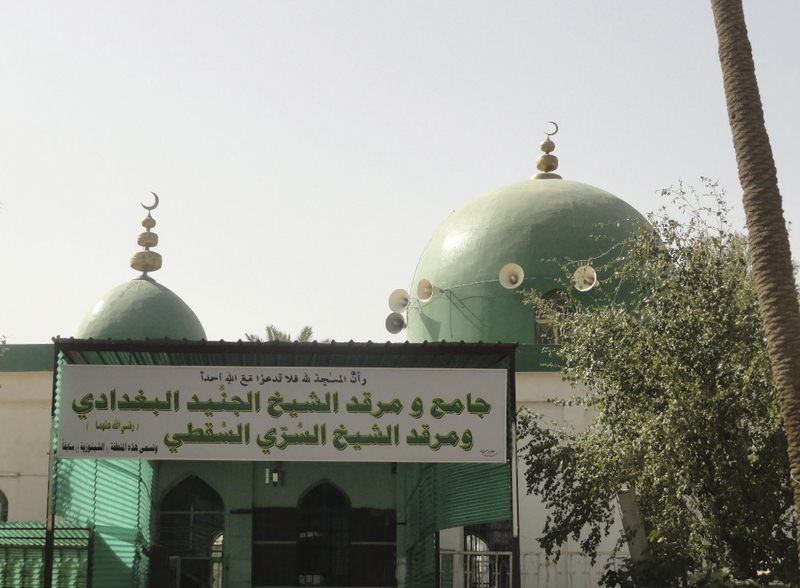 HIS POSITION IN THE SILSILA: Shaykh ala al-Itlaaq, Qutb al-Istihqaaq, Mamba-e-Israar, Sultan-e-Tariqat, Sayyid at-Taaifa, Hadrat Shaykh Junaid Baghdadi is the eleventh Imam and Shaykh of the Silsila Aaliyah Qadiriyah Barakatiyah Ridawiyah Nooriyah. He is the Mureed and Khalifa of Hadrat Sirri Saqti Radi Allahu Ta'ala Anhu. BIRTH: He was born around the year 218 Hijri in Baghdad Shareef. NAME: His name is Junaid-e-Baghdadi. He was known as Abul Qasim and he was blessed with titles such as, Sayyidut Taaifa, Ta'oosul Ulama, Qawareeri, Zuj'jaan and Lisaanul Qaum. HIS EXCELLENCE: He was a great Aalim and Mufti. In his era, he was ahead of all in wisdom and eloquence. From the beginning, right up to the end of his life, he was loved by all. Everyone was pleased with him as the leader. There is no person that can point even a finger at the Maqaam of Hadrat Junaid-e-Baghdadi. The only people who could not see the station of Hadrat Junaid-e-Baghdadi were those who were blind in faith. He was known as the voice of the people, but he always called himself Abdul Masha'ikh (the servant of the Masters). Many of the Ulama also called him Sultan al-Muhaqiqeen. He had reached very high levels in Shariat and Tariqat. Many great Shaykhs followed his Silsila. He was the greatest Shaykh of his era. He spent time in the khidmat of Hadrat Muhaasibi. Once someone asked Hadrat Sirri Saqti if the Mureed can be more famous than the Peer and Hadrat Sirri Saqti said, "Yes, it is possible. The perfect example is right before you. I am the Peer of Junaid-e-Baghdadi, but he is more exalted than me." HIS CHARACTER AND HABITS: Even though Hadrat Junaid-e- Baghdadi was such a great Wali, he was very humble. He always showed great respect to others, even to those who were not as exalted as him. Once he said to his mureeds, "If only I knew that it was better to read two rakaats of nafil than being with you, then I would have not sat amongst you." He kept fast for most of his life. BUSINESS: Hadrat Junaid Baghdadi initially did business, and used to sell mirrors. His manner was, that he used to enter his shop, and then read four hundred rakaats of nafil salaah. This, he continue for many years. He then left his shop, and sat in the khidmat of his Peer-o-Murshid. He took a room in the house of his Peer and then spent his time their cleansing his heart. When he used to enter the state of Muraqiba, he would remove the musalla from under him as he did not wish to concentrate on anything. He only engrossed himself in the love of Allah and His Rasool. He spent forty years in Muraqiba (deep spiritual meditation). For thirty years, he stood after Esha until Fajr and make Zikrullah. He used to make his Fajr Salaah with the wudhu of Esha. He says, "For twenty years, I did not miss the Takbeer-e-Oola (First Takbeer of Namaaz in Jama’at), and if I thought of any worldly thing during Namaaz, I would repeat my Salaah, and if I thought of Jannat or the Hereafter in my Salaah, then I used to make Sajdah-e-Sahw." A SINCERE MUREED: Hadrat Junaid Baghdadi had numerous mureeds, but there was one particular mureed, towards whom he paid special attention. A few disciples were not pleased with this and asked him why he gave preference to the mureed over others. Hadrat said that he is the most intelligent and wise amongst all of them, and it was for this reason that he gave preference to him. Hadrat then said, "Let me prove this to you." He gave a chicken and a knife to each mureed, and asked them to sacrifice it where none would be able to see them. Each of the mureeds found a very quite and secluded area, and sacrificed the chicken. This one mureed, came back without slaughtering the chicken. Hadrat asked why he did not slaughter the chicken, and he said, "Huzoor! Where ever I went, I found the Qudrat of Allah present there, and I knew that He is All Seeing. It is for this reason that I had no option but to return without success." Hadrat then said, "Now, did you hear his answer. This is the reason due to which he is so dear to me." HIS TRUST IN ALLAH: Once a man presented him with five hundred Ashrafis (coins). Hadrat asked if he had any other wealth with the exception of the five hundred Ashrafis. The man replied that he did. Hadrat said, "Will you ever need any more money in the future?" He said, "Why not Huzoor. There is always a need for money." Hadrat said, "Then you should keep these Ashrafis for yourself, for you are more needy than I am, since I have nothing, and still, I have no need for anything more. Even though you have wealth, you are still in need of more. I would really appreciate it if you would please take back this money, as I do not take from those who are in need themselves and I believe that My Lord alone is Ghani and the rest of the world are Faqeer." HIS KARAAMATS: Hadrat Junaid-e-Baghdadi says, "The greatest Karaamat is to remain firm on the Shariat-e-Mustafa SallAllaho Alaihi wa Sallam." There is no doubt, that Hadrat Junaid-e-Baghdadi was very firm on the Shariah, and his every action was the reflection of the Sunnah of the Prophet SallAllaho Alaihi wa Sallam. PROTECTION FROM SHAITAAN: Once, there was a mureed of Hadrat Junaid-e-Baghdadi , who felt that he had perfected himself (become Kaamil). He thus, began to live in total seclusion. At night, he used to dream an Angel, which used to present a camel for him. He used to then sit on the camel, and the Angel would take him on a journey of Jannat. He used to enter a place that was very beautiful. He used to partake in delicious food and drinks, and he saw the most handsome people there. After a while, he would return to his home. He reached such a state, that he began to tell people, "I am amongst those who visits Jannah daily." This message reached Hadrat Junaid-e-Baghdadi. Hadrat then went to visit him, and found him sitting with great pomp and splendour. Hadrat asked him about his claims, and he explained everything in detail. Hadrat said, "Tonight, when you reach this place, you must read Laa Howla wa Laa Quwwata il'la Bil'laahil Aliyil Azeem" That night, when he had the dream and he reached the so-called Jannat, he read as Hadrat instructed him to. The moment he read this, all those in his dream began to shriek and flee from him. He then sees that he is on a horse, and there are skeletons in front of him. On seeing this, be became afraid, and realised his mistake. All that he was seeing was just an illusion of Shaitaan. He immediately rushed to Hadrat Junaid-e-Baghdadi and repented for his behaviour. He also learnt, that for a mureed to be by himself is like taking poison. GEMS OF WISDOM: Some of his beautiful and wise sayings are being presented, so that we may read and make amal upon them. -A Sufi is like the earth, that all the dirt is thrown onto him and yet it blossoms into a green pasture. -A Sufi is one, whose heart is like Hadrat Ibrahim , that it is free from the love of the world and one which is always ready to obey the commands of Allah, his acceptance should be like that of Hadrat Ismaeel , his sadness should be like that of Hadrat Dawood , His patience like that of Hadrat Ayoob , his eagerness should be like that of Hadrat Moosa and in Dua, his sincerity should be like that of The Beloved Rasool. -Tasawwuf is that which kills you and lives by itself. -The most powerful relationship, is that of the servant to his Creator, when he tries to understand the secrets of Tauheed, and all roads are sealed to the creation, except the road of the Prophet. -Do not follow him, who follows the Quran and leaves the Prophet. Hadrat Shah Ismaeel Al Aziz (Ridwanullahi Ta'ala Alaihim Ajma'een). WISAAL: When Hadrat became aware of his passing away, he asked for those present to assist him in wudhu, which they did. They had forgotten to make khilaal of his beard, so he reminded them of this. He then went into Sajdah, and began to weep. "O our Peer! You have sent before you so many good deeds and heaps of obedience. What is the purpose for this Sajdah?" He said, "Junaid has never been in so much need as he is now." He then began to recite the Quran, so one mureed said, "Hadrat! Are you reciting Quran Shareef ?" Hadrat said, "What better time is there than now, when my book of deeds will soon be close. I am seeing my deeds before me, hanging in the air by a thin thread as it sways from the wind blowing against it. I am not sure if this wind is one of union, or one of absolution. On one hand, I am seeing the Angel of death, and on the other hand, I am seeing the Pul Siraat. There is the Most Supreme Judge, and the path is there. I am not sure of which path I will pass through." After saying this, he completed the recitation of the Quran. He then read seventy verses of Surah Baqarah. Those present asked him to chant the words "Allah, Allah" He said, "Why are you reminding me. I have not forgotten." He then began reading the tasbeeh on all his fingers. When he reached the Shahaadat finger (index finger), he lifted his finger and said, "Bismil laah hir Rahman nir Raheem" He then closed his eyes, and the soul left his body, allowing him to travel from this mundane world into the Glorious hereafter. Hadrat Junaid-e-Baghdadi passed from this world, on a Friday, the 27th of Rajab, 297 or 298 Hijri. After his wisaal, he was given Ghusl. Those giving ghusl wished to put water on his eyes, when they heard an unseen voice saying, "Do not touch the eyes of my beloved, since those eyes that have closed in my remembrance, shall not open before they see me." They then tried to open his fingers, and the voice said, "Those fingers that have been closed in my name, shall only open on my command." [Masaalik as-Saalikeen, Vol. 1, Page 308]. MAZAAR SHAREEF: His Mazaar Shareef is in a place called Shaunizia, which is in Baghdad Shareef. Once someone asked Hadrat Abu Bakr Shibli a Masla (religious query) whilst he was at the Mazaar of Hadrat Junaid- e-Baghdadi. He said, "I feel ashamed to answer in front of the Mazaar of Hadrat as I felt ashamed to answer in his presence, for I still feel that his sight is upon me." AFTER HIS WISAAL: After his wisaal, a pious person dreamt of him and asked about the questions of the Angels Munkar and Nakeer. He said, "The Angels came to me and asked who is my Lord, and I smiled and said, "My Lord is He, Who took the pledge from me on the first day, thus what need is there for me to answer to the servants, after I have already answered to the King. They Angels then left me and said, 'He is still drowned in love and is resting in the same love.'"